Motorola cannot seem to settle on a single display size or technology. The second-generation Moto X used a 1080p (FHD) 5.2-inch AMOLED panel. It then switched to IPS LCD panels for last year’s Moto X family, increasing the size and resolution of the Moto X Pure Edition’s display to 5.7-inches and 1440p (QHD). For its Moto Z phones, Motorola goes back to using AMOLED displays but with a 5.5-inch size and a QHD (2560x1440) resolution that is dense enough that most people will not be able to notice the subpixel arrangement. While we measured the display performance for both the Moto Z Droid and Moto Z Force Droid with an X-Rite i1Pro 2 spectrophotometer and an i1Display Pro colorimeter for brightness and contrast measurements, the results were very similar; therefore, we will only show the Moto Z Droid in the charts below to reduce clutter. Even though the two Moto Z displays look nearly the same to our test equipment, there is a subtle difference that’s perceptible with our eyes. The extra layers in the Moto Z Force Droid’s Moto ShatterShield display introduce a slight grain or sparkle reminiscent of the anti-glare treatment applied to some LCD displays. The effect is not severe, but it is noticeable when looking at the two displays side by side. The Moto Z Droid reaches a peak brightness of about 350 nits when using the manual brightness mode, which is similar to the AMOLED panels in the Nexus 6P and Meizu PRO 5 but a little shy of the Galaxy Note5’s 380 nits and OnePlus 3’s 413 nits. 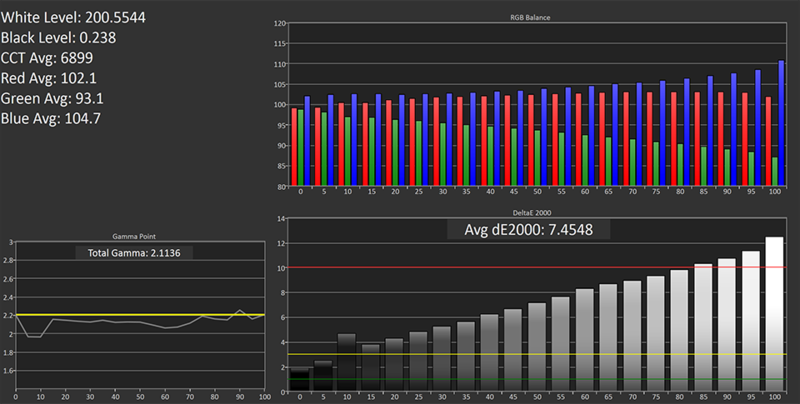 At 50% APL peak brightness increases to 404 nits, but it’s still well below the 500 to 600 nits LCD panels are capable of. The minimum brightness is about 15 nits. Like Samsung’s Galaxy phones, the Moto Z Droids have a boost feature when using auto-brightness mode that increases peak brightness to 504 nits, similar to the Galaxy S7 edge, for a short period of time in direct sunlight. 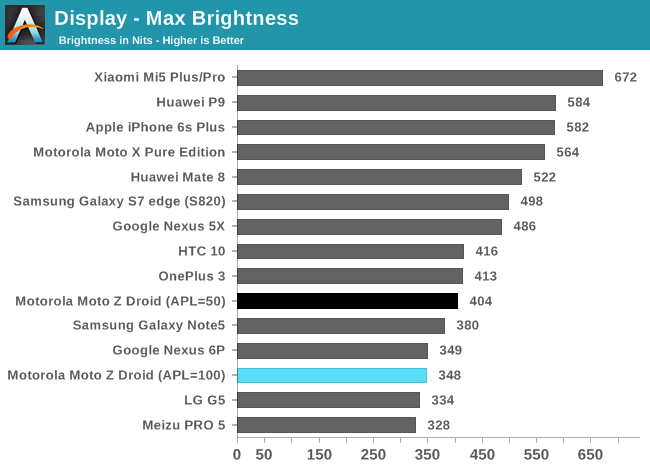 At 50% APL the boosted brightness reaches 591 nits. While viewing the display outside can be difficult when setting brightness manually, the auto-brightness boost puts the Moto Z Droid’s display on par with most LCD screens for outdoor visibility. The Moto Z Droids boast a black level equal to zero, because their AMOLED panels can completely turn off individual pixels. This gives them a mathematically infinite contrast ratio, although reflections on the cover glass reduce the effective contrast ratio for all displays. 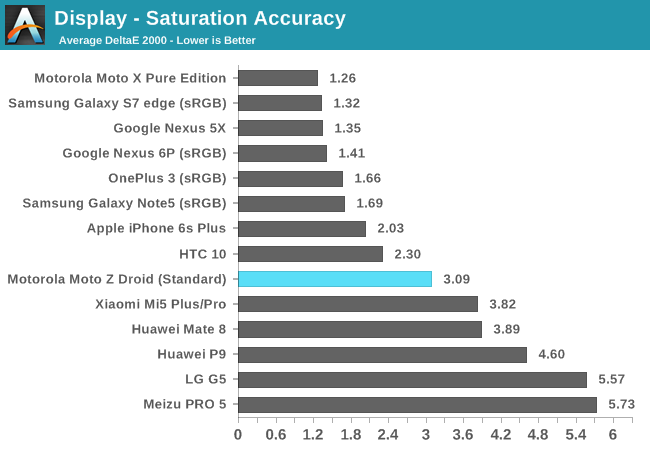 The Moto X Pure Edition has an exceptionally well-calibrated display when using its “Normal” mode, as shown in the charts on this page. After hearing about the switch to AMOLED for the Moto Zs, I was concerned that display accuracy may regress. Many OEMs use the OLED panel’s naturally wider color gamut to display more saturated, vibrant colors, even though they do not match the rendering intent of the source material. 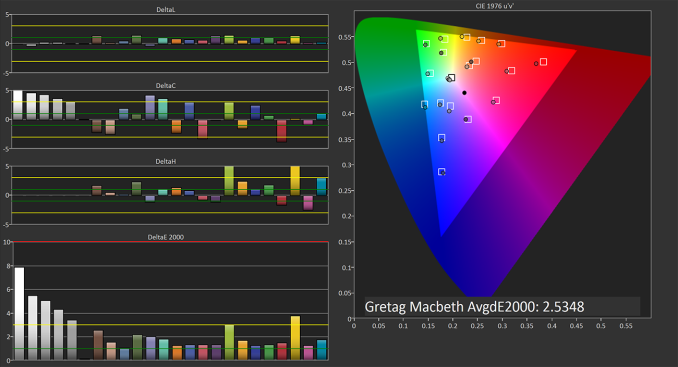 Thankfully, Motorola still includes two different color modes; the “Standard” mode is calibrated for the sRGB color space—which most smartphone content targets and is the only color space Android understands—and should satisfy the customers looking for an accurate display, while the “Vibrant” mode uses a wider gamut that, true to its name, produces brighter colors for people that prefer a more lively display. It seems more OEMs are realizing that their customers perceive display performance differently and are providing options to adjust parameters to their liking. Samsung has provided different display modes for several generations too, and both Google and OnePlus added an sRGB mode to the Nexus 6P and OnePlus 3. Meizu, Xiaomi, and others at least provide some basic control over the display’s white point. It’s good to see some companies take display quality more seriously and give us more control over the light reaching our eyes. Perhaps Motorola should add a color temperature slider too, because both the Moto Z Droids’ Standard and Vibrant modes have a white point above 7,000K, giving lighter shades of gray a noticeable blue tint. In the Standard mode, ΔE2000 grayscale error is actually pretty good from black up to about 65% luminance, staying at or below 3, which is the threshold where error becomes readily apparent. Grayscale error ramps up more quickly in the Vibrant mode because of its cooler white point, reaching a peak ΔE2000 error of around 8 between 70% gray and 100% white. 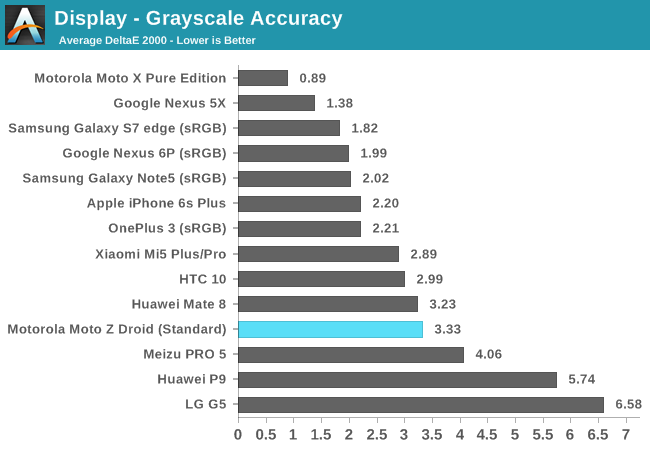 While grayscale accuracy is not bad in the Standard mode, it’s still a step back from the Moto X Pure Edition and falls behind several other flagship phones. Grayscale performance in Vibrant mode is definitely disappointing, however. The Moto Z Droids’ Standard mode adheres pretty closely to the sRGB color space, but it does slightly miss each corner point. 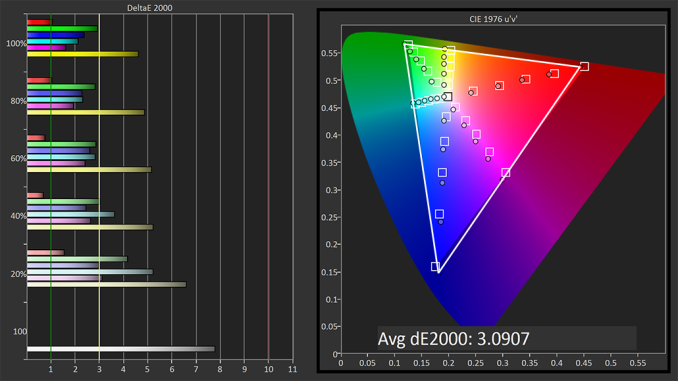 Color saturation levels are generally good except for blue, which shows mild oversaturation. The imbalance between the blue and red primary colors, which we saw in the grayscale results, leads to a shift in hue for the secondary colors yellow and magenta. 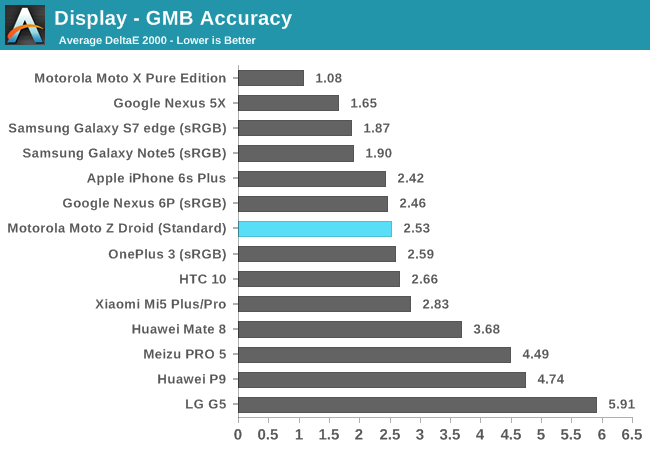 Overall, ΔE2000 error remains at or below 3 above 40% saturation if we overlook the yellow shift, which is not too bad; however, once again the Moto Z Droids fall behind the Moto X Pure Edition and the sRGB modes of several other current flagships. The Vibrant mode covers a much larger gamut, extending beyond the sRGB color space with all three primaries and providing roughly 10% to 20% higher saturation levels for most colors. It’s enough to make colors look more intense without going too far and making them look cartoonish. Despite the grayscale issues, the Moto Z Droids show pretty good color accuracy when using the Standard mode, with most measured colors at or below a ΔE2000 error of 3, which is comparable to the iPhone 6s Plus, Nexus 6P, HTC 10, and OnePlus 3. AMOLED displays generally exhibit more color shift but less luminance variation than IPS LCDs when viewed from different angles. This holds true for the Moto Z Droids that both exhibit color shifting similar to the Galaxy S7 edge. The color shift becomes noticeable at about a 45° angle to both the horizontal and vertical axes. The Moto Z Force Droid also shows a rainbow pattern when viewed from the side that’s not visible on the Moto Z Droid or other AMOLED displays, presumably from one of the extra layers in its ShatterShield display. The Moto Z Droid has its own unique issue: It has a severe magenta color shift at extreme viewing angles in both directions. This will not be an issue during normal use, however. The new AMOLED displays in the Moto Z Droid and Moto Z Force Droid look very good but calibration issues hold them back from achieving their full potential. 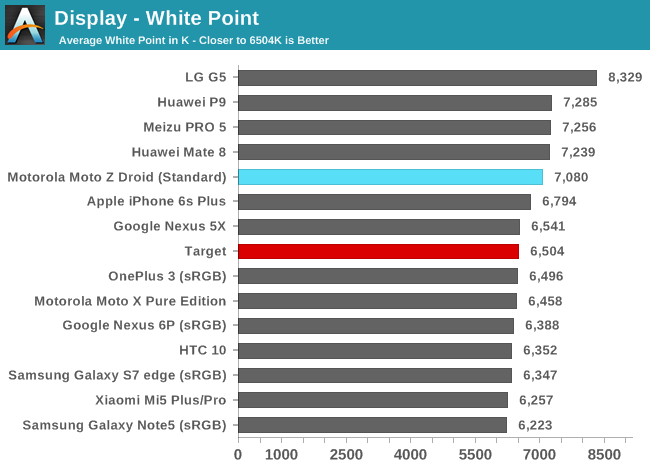 Black levels, brightness, and viewing angles are generally comparable to other flagship phones using AMOLED panels, and besides the cooler than ideal white points for both the Standard and Vibrant modes that hurt grayscale accuracy, there are not any other major issues with display performance.